Article 5 by Kristen Simmons. The Bill of Rights has been revoked, and replaced with the Moral Statutes. I hate writing negative reviews, truly I do. However, Article 5 left me feeling incensed. Why? Because it had so much potential to be a really good book. Simmons was actually able to keep drawing me in with her narrative voice, no matter how much I wanted to stop reading. 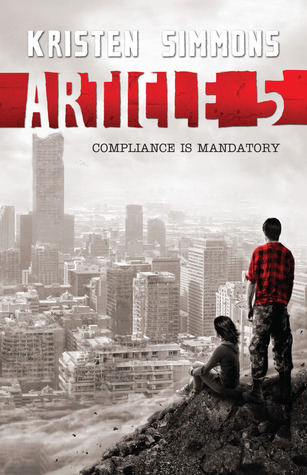 Her writing style is really captivating, but the substance of Article 5 was disappointing. There weren't enough explanations to back up the dystopian world she created. What was the war all about? Who invaded the US? Did anyone actually invade the US or was it an uprising of ridiculously prude people? Was that why the Bill of Rights were revoked and replaced by Moral Statues? And more importantly... why was there still hot chocolate in a world where you get food stamps??? What frustrated me the most with this book was the main character, Ember. I just felt that there was no real growth in her character throughout the story. She remains childishly selfish for a good 85% of the book. She commits the same mistake twice, in the space of a few days. The first time didn't even have a substantial enough reason behind her actions. The big twist in the story was also disappointingly, glaringly obvious. If it had been perhaps done differently, it could have worked. There were also a few similarities to Twilight. Chase, who has Native American blood, is often described as wolf-like. He also used to have longer hair, which he'd cut off shorter since joining the werewolf pack. Oh sorry, I mean, the Moral Militia. There's also a mother that is described as a bit of a useless, but very loving, free-spirit. Also, the seemingly inexplicable love that Chase has for Ember, whom he grew up with. Goodness knows why, because the most Ember ever did for Chase was that she simply sat there and held his hand when he'd lost his parents years before the story commences. Wow. Way to go Bella. I mean, Ember. In short, I won't be reading the rest of the trilogy. rating: 1 out of 5 chocolates. I appreciated this honest review. Sometimes books aren't quite what we hope they will be. You are very clear about the reason for this review and it is well written. Thanks for sharing! A selfish character can be a real downer. I haven't read this one yet but hope to give it a try soon. Thanks for your review. Oh, Thanks for saving me the trouble of picking up this one! Sounds so frustrating!